Roger Bryant is a long-term observer in the Carter Center's election observation mission in Lebanon. After a career in the British Navy, Roger worked with the Organization for Security and Co-operation in Europe (OSCE) mission to Bosnia-Herzegovina for a number of years before becoming involved in election work abroad as administrator and then as a long-term observer. Roger was a member of the Carter Center's observation mission to Nepal in 2007-8. Together with the other long-term observers, I arrived in Beirut at the beginning of March, and after team formation and briefing deployed to the northern coastal city of Tripoli – one of the three long-term observer bases. Our area of observation is North Lebanon governorate together with the districts of Jbeil and Kesrwan (from Mount Lebanon governorate) – about one-third of this geographically small country. Our initial focus was in Tripoli to find out who's who and what makes politics and elections tick. Politics is said by many to be the national sport of Lebanon and it didn't take long to find a complex web of interlinking strands and many that we met with couldn't understand why I couldn't understand. Most interlocutors readily shared their views on the country's electoral process and administration, their sense of the political environment, and irregularities in the campaign. They were quick to point out the gross irregularities perpetrated by all the others while explaining their own exemplary behaviour. Few had done anything to formally bring to the attention of proper authorities the misdemeanours of their competitors – "This is Lebanon, everybody (except me) is doing it." This often accompanied by a wry smile. We generally found a welcome from people who were pleased to see international interest in their electoral process, the first since the cessation of direct Syrian involvement in the country's affairs. In some cases, the benefits of international observation had to be explained at length to skeptical hosts. Folk were inquisitive about our presence and always ready to help us find locations of people and places. We are in great danger of overdosing on the Turkish coffee offered as hospitality during our travels across northern Lebanon. The process in Lebanon has one or two novel features. Perhaps the most striking to anyone looking in from the outside is that no official ballot is printed. Candidates and political parties form lists according to the number of seats available in each electoral district. The voter can enter the assigned polling station with a prepared ballot – probably offered by political lobbyists outside the station – including names of candidates up to the number of parliamentary seats allocated. Alternatively, the voter can receive a blank piece of paper inside the station on which he or she can, in secrecy, hand-write his or her own preferred list. But it's not as simple as that. The 128 parliamentary seats are allocated among religious affiliations. Each electoral district will then be allocated a proportion of these seats depending roughly on the proportion of voters in that district and the division by religion. Of course, we are bound to meet a great variety of characters and personalities while going about our observation tasks. Perhaps the most surprising is a candidate running in the most northerly district of the country – a fishmonger, usually seen selling fish from the back of his van. He received us in his house and introduced us to some of his 15 children. A 16th is expected soon. To find his house was easy. Everybody for miles around knows him, and they have all been approached on numerous occasions in recent weeks to give directions as to where the candidate is to be found. Running on a platform of regaining the rights of people – especially for the poor –he has not been adopted onto any electoral list, and he feels that some will regret that. He sticks to his position as a confident independent. Despite accusations of vote buying or rule bending, the warmth of the people breaks through. Family ties remain strong – including with the majority of citizens of Lebanon who live and work outside the country. The well-being of the country is uppermost in all their minds. High numbers of the diaspora are expected to combine their periodic visit home with the opportunity to attend at their polling stations on June 7. Voters live in, or will return to, a most beautiful home country. Roger Bryant with his long-term observer partner Marwa Alkairo in Tripoli, Lebanon. Bryant and Alkairo often have meetings across diverse areas of northern Lebanon in a single day. As the geography changes from the seacoast, to the cedar forests in the north,then to the snow-filled mountains, Bryant and Alkairo joked that team al-Shamal (the North) has gone through the four seasons of the year in one day. 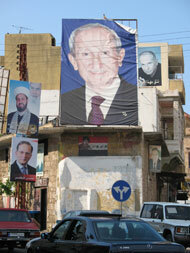 Campaign posters displayed prominently in Tripoli, Lebanon.